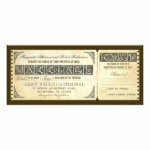 Make your day special by sending out one of these Vintage Telegram and Ticket style wedding invitations to your friends and family. And you can add your own text to them easily and within minutes! There's no doubt at all that one of the most crucial and thrilling moments in one's life is their wedding day as its signification in one's entire life cannot be ignored at all. This is one of the many reasons as to make it as memorable, historic and joyous as possible with a multitude of invitees not only to attend and witness this life-changing and spectacular occasion, but also to provide the much-needed support to the newly-wed couple as they start their marriage journey. 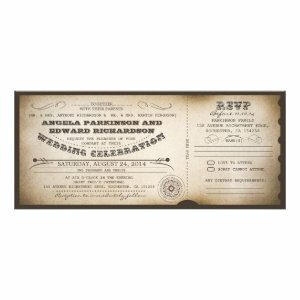 It is true that with many weddings taking place simultaneously in many places, one of the best and proven methods of captivating the attention of the invitees and increasing their chances of gracing one's occasion, is to use an assortment of vintage telegram wedding invitations. 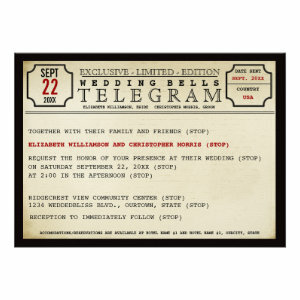 Apart from their signature and rich design, vintage telegram wedding invitations captures the attention of the eye in a very spectacular way with authentic designs that linger in the mind for long periods of time. 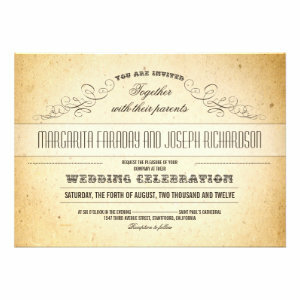 We live in an age whereby almost everyone is trying to attract another with all kinds of advertisements, fliers, letters and other forms of marketing; and being able to stand out from the crowd with a wedding telegram invitation, greatly improves a couple's chances of getting the best attendance possible for their very auspicious wedding occasion. 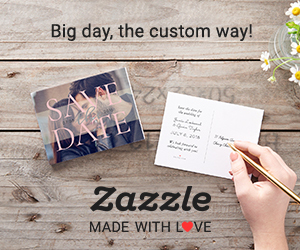 Ticket style wedding invitations are increasingly becoming one of the most original ways of requesting close friends and relatives to celebrate one's wedding in style. 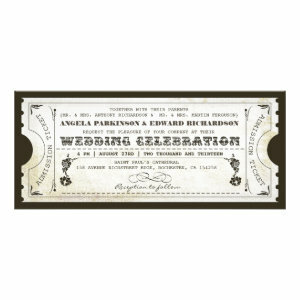 Our Vintage Telegram Ticket Style Wedding Invitations are perfect for those looking for something a bit retro. The traditional style of design has always been a popular choice for weddings but with more couple looking to tie the knot in specialist or themed weddings they are even more popular than ever. 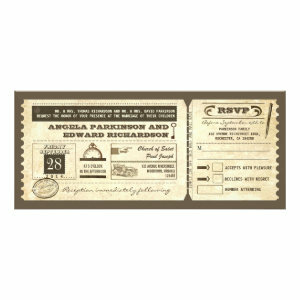 Vintage telegram invites can be used for all manner of wedding themes, like for a Steampunk wedding, a garden party or vintage tea party wedding, a 20's-30's or 40's Era themed wedding or even just a traditional church wedding. With a selection of plain and decorative designs to choose from it's even easier to pick a style to match your wedding. All of the text can be personalized to suit your requirements, with font style, size and colour fully customizable*. Just enter the guests name, wedding date and details. It's as simple as that. 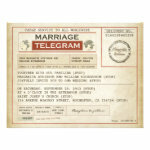 Vintage Telegram Wedding invitations are a lovely way to announce your wedding plans to family and friends.